The most important question at Microsoft's Gamescom play session on Tuesday? What are they serving for lunch? That question answered here. Perhaps my fascination with the food served at press gatherings stems from the fact that 90% of my Gamescom diet comes from exactly these sorts of boxes. Well, not exactly these sorts of boxes. 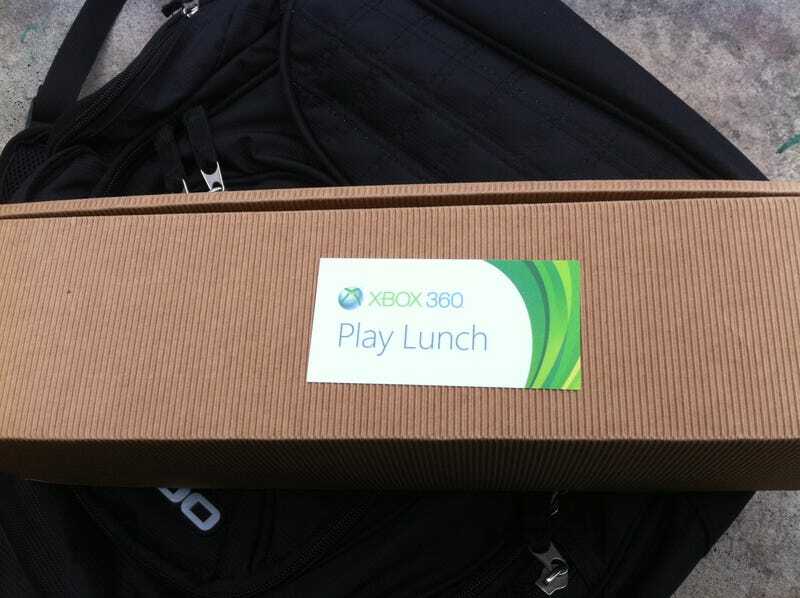 This long, thin, corrugated cardboard number emblazoned with the label "Play Lunch" is special, if only because of that sticker. Inside there were a bag of BBQ chips, an apple, a weird sort of chicken wrap thing, and a blueberry muffin, not pictured. Alas, the muffin was the best of the box, and didn't last long enough to get its 15 seconds of fame. Maybe later. The most notable thing about this lunch is that there was actual flavor to the wrap. It was a little tangy, and even a bit spicy. You don't get that in North America. In the U.S., they are afraid actual taste might offend someone, so they limit the flavors allowed in any box lunch to salty, and that only covers the chips.